For a truly authentic Brazilian food experience you can't go past Brazilian barbecue, officially known as churrasco (pronounced shoo-ras-coo). 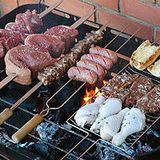 Churrasco is a style of cooking whereby meat is slow roasted on a spit over sizzling hot coals, and basted in a variety of sauces such as chimichurri, red wine and garlic butter. Brazilian BBQ restaurants generally have you pay a flat price for all you can eat and they will literally keep serving you until you can't eat any more. Your money gets you up to twenty different cuts of meat, generally consisting of beef, lamb, pork, Brazilian sausage, chicken and seafood. The meat is brought out on skewers and sliced for you at the table. Your meal also comes with a host of accompaniments such as rice, beans, salsa, potatoes and grilled pineapple to finish. You definitely won't leave hungry. not long after you sit down. You can choose between the full BBQ of ten different cuts of meat ($38) or the half BBQ with seven ($30). For those who don't eat meat they even have a vegetarian BBQ. As with all Brazilian BBQ restaurants the meal is accompanied by sides such as black beans, rice and cheesy potatoes. While their BBQ selection is only small, what they do offer is extremely well cooked and comes basted in a variety of sauces. Make sure you save room for the cinnamon grilled pineapple at the end of the meal. Churrasco – Kings Cross. Located on William St, just outside the city Churrasco could be considered an up-market Brazilian BBQ experience. The low lit dining room consists largely of communal style tables where groups of up to 40 people can be seated. An extensive wine rack acts as a divide between the main dining room and a second, smaller dining room. If you're after a more intimate dinner there are several smaller settings away from the main room. The menu leans more towards red meat, with offerings of eye fillet, sirloin, rump, lamb and ribs, however they also have several types of sausage, chicken and pork available. Churrasco offer standard sides and as an added bonus have grilled haloumi on the menu. They also offer salads but at $10.50 they're not cheap. The meal will set you back $35. You should definitely try the grilled haloumi. I couldn't agree more... Balmoral Beach is one of the most placid beaches in the north shore - but certainly not the cleanest or clearest. Still, great for swimming and people watching. Ask for a seat outside and watch the bustle of Darling St- Correction Norton street. I’m glad that there are many churrasco restaurants in Sydney. I tried it for the first time at Coogee and though the food was alright, the service was unfortunately appalling. I’m guessing I’m going to try these other places out. Thanks! I like the Brazilian BBQ restaurants in Sydney (the ones I have tried). They actually have tasty cuts of meat, all you can eat and variety. Also I tried the Brazilian beer Skol, it was great ! It went really well with the meat bonanza.